~Slow Plot: It felt as though the plot didn’t really pick up until Clariel left Belisaere and began to travel with Bel. I found it difficult to relate the story of Clariel back to the other narratives of the Old Kingdoms. I kept thinking, “How does this relate to the Old Kingdom Trilogy?”, especially since the book kept associating Clariel as the lost Abhorsen. However, when I figured out Clariel’s future identity I found the story easier to process. ~Loads and Loads of Characters: The book series makes a big deal about how the blood lineages of the Royal Family, The Abhorsens, The Clayr are all connected, however the truth is that the Abhorsen and Clayr family have little to do with the main story, Bel and the main Abhorsen family are side-characters. 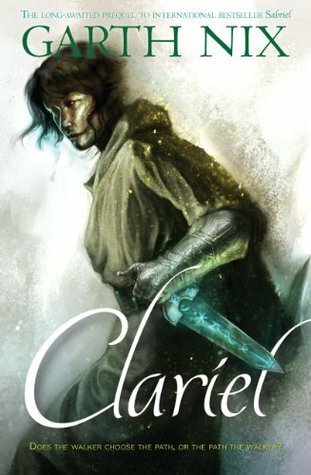 I think Clariel introduced a lot of side-characters who were interesting but I felt Garth Nix didn’t really use them to their full potential. ~Designated Protagonist Syndrome: While I liked Clariel as a character, I felt she was a little bland, her future identy seems a lot more interesting. Garth Nix states he isn’t sure of the events that led Clariel to become who she is in future, this is one of my major pet peeves with authors as I feel that this is mostly a cop-out, as a writer he may not know the specifics but he should at least have a general idea. I found Clariel was most interesting when she struggled against temptation, the fact that most of the time she was able to resist makes her future identity choice interesting, but not surprising. However, I did find Mogget’s previous statements about her were contradictory, he clearly didn’t know her well enough to pass judgement and give a proper evaluation on her. ~In-Universe Time-Line Confusion: I would have preferred it if Garth Nix had made a short time-line note, like “this is x amount of years before the events of Sabriel”, I’m estimating that Clariel takes place centuries before Sabriel, that’s quite a gap, which did make it rather bitter-sweet to see how the Abhorsen were once a large clan (that didn’t always agree or get along) reduced to a single line of succession. The role of Abhorsen isn’t just genetic, there is an element of choice involved. All in all, an okay read that wasn’t quite what I expected, but it was interesting to read more about the Old Kingdom’s previous history. Clariel takes place 600 years before Sabriel. I did like this and I thought the moral ambiguity was really interesting, but the other books are my favourite.